Flavor Text: No quarter asked or offered. So a character can go Mano-a-Mano with a Support card? Having a fist fight with Rite of the Silver Gate just doesn't seem right in my mind. They probably made it any card later, because well, Agency needed it heh. Still like it. I find it interesting that this is the first example of selective textbox blanking: everything but Subtypes - odd. Danigral - 4 out of 5. I really like the blanking theme going on with Agency. It makes for a potent combination with Hastur who has struggled to get effects that remove willpower, and helps Agency slice through those tough characters. Sure there are times when you won’t be able to play it, but those will be few and far between, and often blanking a character you control is a non-issue, or maybe even beneficial if it’s something like King John. 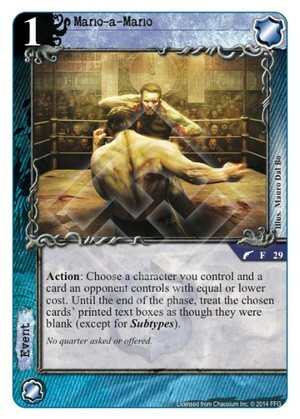 This is a similar effect to a card from A Game of Thrones which also saw a lot of top tier play as versatile pseudo-control for locations (supports) and characters. mnBroncos- 4 out of 5. Very good card. You getting to choose what is blank is key, also you can blank a character you own that you have already used his ability or not useful. A turn of turning of your opponents key effect for a turn will always be playable. Obtuse - 3 out of 5. There are a lot of words on this card, don’t you think? I like that it doesn’t just target other characters, so your King John could go “Mano-a-Mano” with, say, a Snowmobile. Seems weird, but ok.
livingend - 2 out of 5. Okay, I can’t come up with a satisfying rating for this card without testing it first. Blanking any card as a standard action is so versatile that evaluating all the different outcomes and ramifications on a theoretical basis doesn’t appear very promising. Drakey and Ire are definitely correct to criticize the myriad of restricting factors though, and that’s also part of the reason why Mano-a-Mano only clocks in at 2 out of 5 for now. Still, there are cards like Stygian Eye out there whose worst nightmare is to face this event in one-on-one combat. Verdict: Kind of a cop-out, but this could go either way I feel. WWDrakey & Ire - 1 out of 5. There’s a thing with play conditions. One is fine. Two, can somehow be managed. Three… starts to get too much. Here we have: 1) needs an opponent’s card where blanking it is useful, 2) a card you control that doesn’t suffer from being blanked, 3) your card needs to cost at least as much as theirs… and that doesn’t take into account that Agency has a lot of good stuff to spend a lone 1-resource domain on, and doesn’t really roll in cards, so usually likes to run more… permanent, solutions.